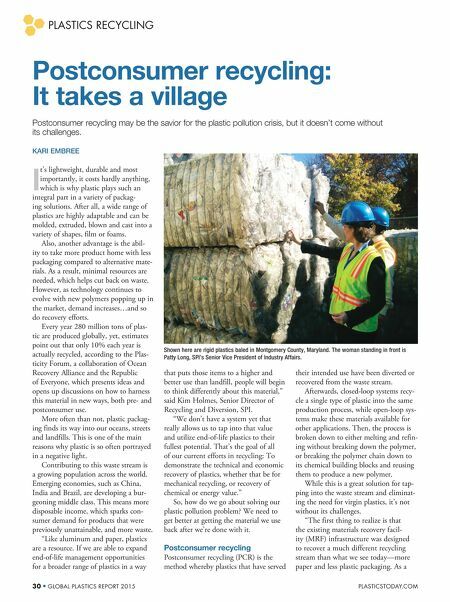 Plastics Recycling 30 global Plastics RePoRt 2015 Plasticstoday.com Postconsumer recycling: It takes a village Postconsumer recycling may be the savior for the plastic pollution crisis, but it doesn't come without its challenges. Kari EmbrEE I t's lightweight, durable and most importantly, it costs hardly anything, which is why plastic plays such an integral part in a variety of packag- ing solutions. After all, a wide range of plastics are highly adaptable and can be molded, extruded, blown and cast into a variety of shapes, film or foams. Also, another advantage is the abil- ity to take more product home with less packaging compared to alternative mate- rials. As a result, minimal resources are needed, which helps cut back on waste. However, as technology continues to evolve with new polymers popping up in the market, demand increases…and so do recovery efforts. Every year 280 million tons of plas- tic are produced globally, yet, estimates point out that only 10% each year is actually recycled, according to the Plas- ticity Forum, a collaboration of Ocean Recovery Alliance and the Republic of Everyone, which presents ideas and opens up discussions on how to harness this material in new ways, both pre- and postconsumer use. More often than not, plastic packag- ing finds its way into our oceans, streets and landfills. This is one of the main reasons why plastic is so often portrayed in a negative light. Contributing to this waste stream is a growing population across the world. Emerging economies, such as China, India and Brazil, are developing a bur- geoning middle class. This means more disposable income, which sparks con- sumer demand for products that were previously unattainable, and more waste. "Like aluminum and paper, plastics are a resource. If we are able to expand end-of-life management opportunities for a broader range of plastics in a way that puts those items to a higher and better use than landfill, people will begin to think differently about this material," said Kim Holmes, Senior Director of Recycling and Diversion, SPI. "We don't have a system yet that really allows us to tap into that value and utilize end-of-life plastics to their fullest potential. That's the goal of all of our current efforts in recycling: To demonstrate the technical and economic recovery of plastics, whether that be for mechanical recycling, or recovery of chemical or energy value." So, how do we go about solving our plastic pollution problem? We need to get better at getting the material we use back after we're done with it. Postconsumer recycling Postconsumer recycling (PCR) is the method whereby plastics that have served their intended use have been diverted or recovered from the waste stream. Afterwards, closed-loop systems recy- cle a single type of plastic into the same production process, while open-loop sys- tems make these materials available for other applications. Then, the process is broken down to either melting and refin- ing without breaking down the polymer, or breaking the polymer chain down to its chemical building blocks and reusing them to produce a new polymer. 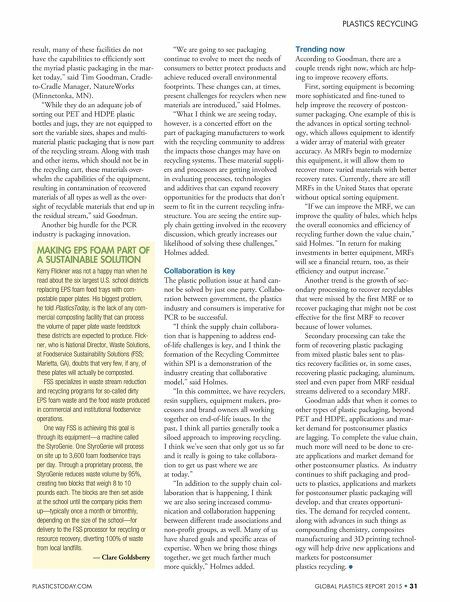 While this is a great solution for tap- ping into the waste stream and eliminat- ing the need for virgin plastics, it's not without its challenges. "The first thing to realize is that the existing materials recovery facil- ity (MRF) infrastructure was designed to recover a much different recycling stream than what we see today—more paper and less plastic packaging. As a Shown here are rigid plastics baled in Montgomery County, Maryland. The woman standing in front is Patty Long, SPI's Senior Vice President of Industry Affairs.